With the upcoming "Dark Knight Rises" movie set to hit next year I guessed it was as good a time as any to look back at the mega story line that gave us Bane, and the breaking of the bat. 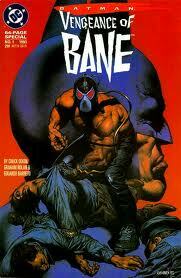 This story gives us a great deal of back story on Bane. As a young baby he is sentenced to serve a life term for the crimes of his father, who is a revolutionary on the small island of Santa Prisca. Bane's father escapes and Bane is sent to prison in his stead. As a small boy he learns the in's and out's of his prison/home. He watches his mother die while in prison. After his mother dies, Bane is sent out into general population and kills an inmate who wants the small boy to work for him. It is also during this time that Bane befriends three inmates, Zombie,Trogg and Bird. After killing an inmate Bane is sent into the hole for many years. He earns the name Bane because he just refuses to die. This greatly upsets the warden, who has a great dislike for Bane. During his time in the hole Bane has a dream where he kills a giant bat demon. Once returning to Gen Pop he learns from Bird about Gotham city and how The Batman rules said city. During the next few months Bane becomes obsessed with killing the Batman. After spending months learning to read and reading every book in the library Bane is given the chance to undergo a treatment for a drug known as Venom. Bane is the only test subject that can withstand treatments and once they are complete he and his three henchmen break out of Santa Prisca to Gotham. Along the way Bane kills the warden who tormented his for so many years. Once in Gotham, Bane and Bird kill the gangster Tommy "no nose" for setting Bird up to take the fall and be sent to Santa Prisca. Batman makes a very brief appearance toward the end of the story where after breaking up a mob shoot out comes face to face with Bane for the first time. Bane tells Batman that he is strange, how can a man cloaked in darkness not kill? I really like the line in which Batman says to Bane. "You're threatening me? Get in line." Bane makes a vow to Batman that one day he will scream for mercy and his name.